This SaltDogg TGS01B Salt Spreader is a commercial grade spreader. Carry more material with the 602 lbs. capacity black polymer hopper. Spread more salt over a 3-30 ft. range with a gravity feed mechanism that has internal auger assistance. Also a powder coated orange steel mounting frame allows for easy hook up and has a fold-away feature for easy access to the tailgate or rear door. Motor: A 12V DC motor gives enough power to do all the spreading you need. Hopper: A rugged black polymer hopper holds up to 8.0 cu ft/602 lbs. of spreading material. An ultra-smooth interior and auger design assists in providing for an easy material flow. Mounting Frame: Made to resist rust and corrosion the orange powder coated steel mounting frame has a fold-away feature to give you easy access to rear door or tailgate. Feed Mechanism: A gravity feed with internal auger assistance spreads your salt wherever you need it. Spread Width: Cover more ground with the spread width of 3-30ft. Capacity 8.0 cu ft. /602 lbs. 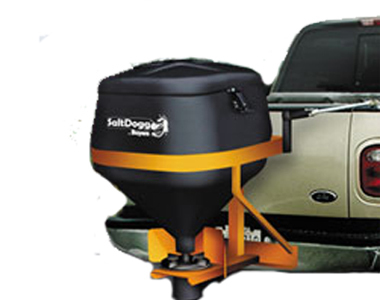 Ask us about the SaltDogg TGS01B Tailgate Salt Spreader. Please no repair questions. Your Q&A may be posted to SnowblowersAtJacks.com to help other shoppers, like you, with their purchasing decisions. Thank you. Add options now for your Buyers TGS01B Spreader at a 1 time discounted price. When you are ready to check out, just click the ADD TO CART button.